Looking for a New Hyundai Sonata in your area? CarGurus has 886 nationwide Hyundai Sonata dealers with 86,596 new car listings. On paper, the 2018 Hyundai Sonata is one of the smartest picks in the midsize family sedan segment. So why isn’t this car more popular? Affordable and a great value, the 2018 Hyundai Sonata is roomy and safe, it comes with a killer warranty and roadside-assistance plan, and it offers the latest technologies. Plus, you can get it in regular-strength, turbocharged-strength, hybrid, and plug-in hybrid versions. There’s something for everyone here! Best of all, thanks to a long list of changes for 2018, the Sonata is better than ever. Generally speaking, people have stopped buying cars. Instead, they want crossover SUVs, and for lots of good reasons. Nevertheless, within its competitive segment, Sonata sales are in steeper decline than those of most other midsize sedans. My bet is that people find the Sonata boring. As luck would have it, I recently rented one during a vacation. Despite its basic SE trim, that 2017 Sonata rental was perfect for my family of four and our week’s worth of stuff. But it was pretty dull to look at and a snooze to drive. This new 2018 Sonata is definitely improved in the looks department. The front end is new from the windshield forward, better tying the Sonata to other Hyundai models. 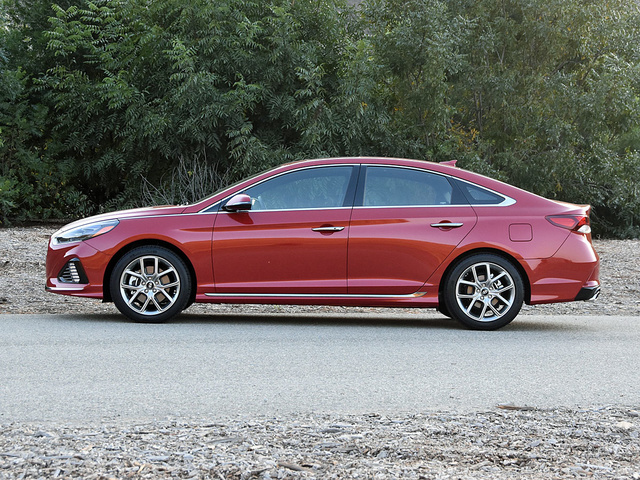 Around back, a new trunk lid, taillights, and bumper give the Sonata a more upscale look. Overall, the result is a greater sense of style, a trait lacking in the previous version of the car. Granted, my test car was the top-of-the-line Sonata Limited 2.0T with the turbocharged engine, the fanciest wheels, and the nicest interior. But considering that the sticker price was just $33,460 before applying any discounts (which are always available), you can easily get this same level of style and equipment for less than the average transaction price of a new car today. Changes to the 2018 Sonata’s interior are not as obvious. New finishes dress up the cabin, and I particularly like the piano key buttons for main infotainment menu selections and the climate controls. The blue stitching and piping on my test car’s seats match the cool blue nighttime cabin illumination, and I like the carbon-pattern aluminum trim on the dashboard and door panels. Gauges are updated, too. Otherwise, the cabin is much the same as it was before, emphasizing function and form in equal parts. My Sonata 2.0T test car came with a turbocharged 2.0-liter 4-cylinder engine, which I highly recommend for its seamless power and responsive acceleration. It makes its maximum 260 lb-ft of torque from just 1,350 all the way to 4,000 rpm. At that point, the engine is well on its way to producing its maximum 245 horsepower at 6,000 rpm. The result is a steady flow of mechanical force, strong enough to break the wheels loose off the line and to provide robust passing power at speed. For 2018, every Sonata 2.0T gets a new 8-speed automatic transmission for improved low-end response and better fuel economy on the highway. How does the Sonata actually perform in that regard? The EPA says to expect 26 mpg in combined driving, and I got 24.1 mpg on my test loop. I even used the car’s Eco driving mode for at least a third of the miles covered to offset the mountain driving in Sport mode while using the paddle shifters. Speaking of mountain driving, Hyundai has re-tuned the Sonata’s steering and suspension for improved ride and handling qualities. Turbocharged models take the improvements a step further, with a stiffer sport-tuned suspension, rack-mounted rather than column-mounted electric steering, and a sport calibration for the steering. The front brakes are larger, too, and Sonata 2.0T models have 18-inch polished aluminum wheels wrapped in 235/45 Michelin tires. From the driver’s seat, the Sonata 2.0T instantly feels like it wants to play. 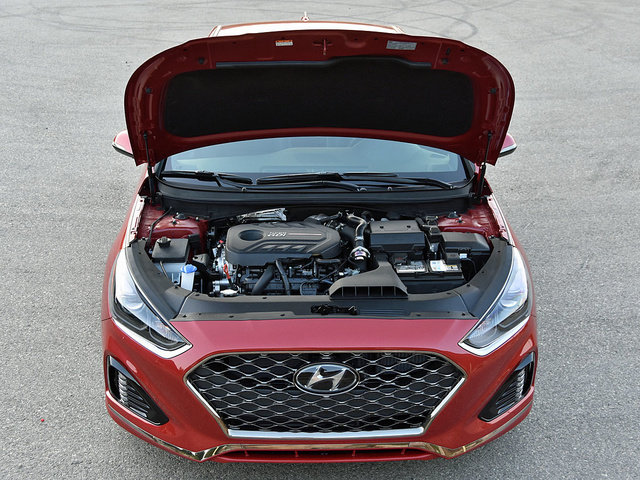 From its speedy acceleration and transmission paddle shifters to its hefty steering effort levels and taut suspension, you can tell this Sonata is the one tuned for rapid transit. The powertrain is terrific, and the brakes proved themselves up to the job of repeatedly scrubbing speed before entering a series of corners and then executing a panic stop. Most of the time, the suspension capably performs its job, too, sharply attenuating jounce and rebound. On undulating pavement, though, it still allows too much body motion, presumably in an effort to preserve some cush in the ride. Also, in spite of the sticky rubber, it’s still easy to tell that this is a nose-heavy front-driver if you enter a corner carrying too much speed. For Hyundai, the steering is nicely done. Stacked up against the competition, it still feels a little too disconnected on center and artificial off-center. Overall, the Sonata 2.0T is enjoyable to drive… and it’s definitely better to drive than the previous version of the car. Trouble is, in this segment there are cars that go faster, or feel genuinely alive in the driver’s hands, or provide the extra traction and capability of all-wheel drive (AWD). And they usually plant a smile rather than a grin on a driver’s face. 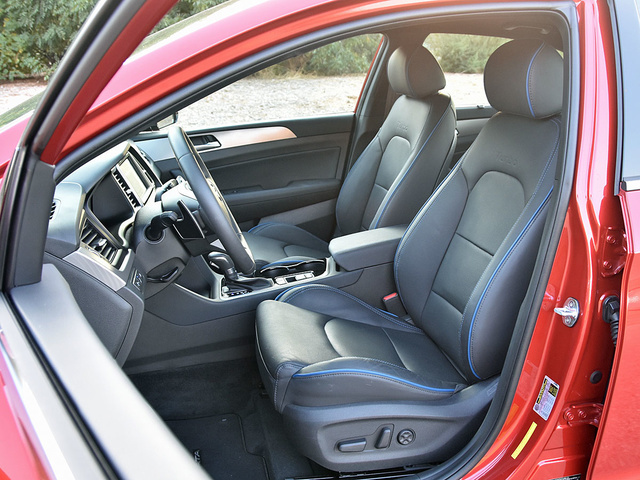 Interior materials look and feel good, the front seats are comfortable, and the Sonata’s rear seat is huge. I like the thick-rimmed, flat-bottom steering wheel, too, and it even has paddle shifters that are actually useful when you’re driving this Sonata like you stole it. My test car had heated and ventilated front seats, a heated steering wheel, rear air conditioning vents, and manual rear side-window sunshades. One thing it didn’t have, because Hyundai discontinued it, is a panoramic glass roof. It’s gone to save weight, improve fuel economy, and reduce the center of gravity. Given how much space the Sonata provides, it is not surprising that the full-size Hyundai Azera has been discontinued. After all, the Sonata might as well be a full-size car. That description goes for the trunk, too. Inside, you’ll find 16.3 cubic feet of volume, making this one of the biggest trunks in the midsize sedan segment. Most versions of the 2018 Sonata are equipped with Hyundai’s Smart Trunk opener, but when it pops open, the lid doesn’t rise out of the way, so it’s somewhat pointless. Additionally, once you’ve loaded it, there is no handle or slot to use to swing it shut, so you’ll need to put your fingers or hand on the dirty outside of the lid to slam it closed. 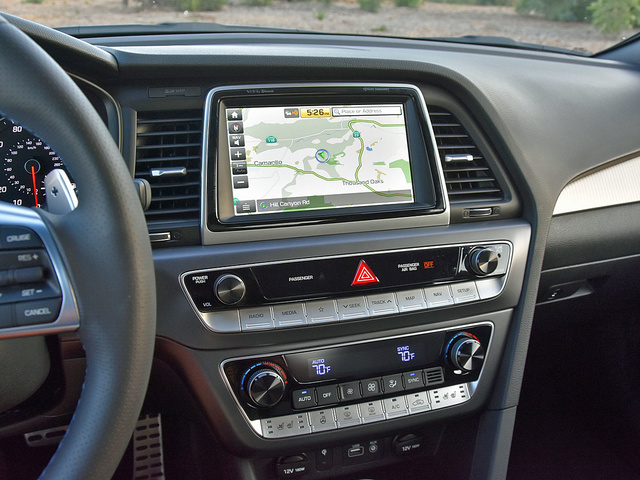 For 2018, Hyundai adds a new USB charging port for backseat occupants, makes wireless device charging available, and installs a faster processor for the optional navigation system, which now offers a bird’s-eye-view vantage point for the map display and free HD Radio traffic information. Apple CarPlay and Android Auto smartphone projection systems are also standard this year. None of this is the big technological news for 2018, though. From my perspective, what’s important for you to know is that every 2018 Sonata with SEL, Sport, and Limited trim provides three free years of Blue Link subscription services. Highlights include automatic collision notification, SOS emergency calling, remote access to certain vehicle features from a smartphone, and safe teen-driver functions related to speed, curfew, and geographic boundaries. These services are all free for the first three years of ownership. In another important change for 2018, Hyundai makes blind-spot monitoring with rear cross-traffic alert and lane-change assist standard on all Sonatas. New lane-keeping assist technology debuts, too, and is included with the available lane-departure warning system. The lane-assist features are bundled with an adaptive cruise control with stop and go capability, as well as automatic emergency braking with pedestrian detection. They’re all optional for SEL and Limited trims, while coming standard for Limited 2.0T versions of the car. Upgraded LED headlights designed to help the driver see better around dark corners are standard for all Limited models. Automatic high-beam operation is an option for the Sonata Limited and standard for the Limited 2.0T. In crash-test assessments, the Sonata excels. It gets 5-star ratings across the board from the NHTSA, combined with a 4-star rollover resistance rating. The Insurance Institute for Highway Safety (IIHS) gives the Sonata top marks in all crash protection tests, as well as for its collision avoidance technologies. The top set of headlights earns an Acceptable rating, while the ease of using the child safety seat LATCH anchors receives a Marginal rating. Ladies and gentlemen, these technologies, combined with these crash-test ratings and the three free years of Blue Link safety-related services, make the 2018 Sonata an extremely safe family sedan. In a segment declining in popularity, the updated Hyundai Sonata is facing two all-new, heavy-hitter midsize sedans for 2018: the redesigned Honda Accord and the redesigned Toyota Camry. I’ve driven the Camry. Dynamically, it impresses. But it isn’t perfect. And if I had to choose between this Sonata and a Camry XSE, I think I’d go with the Hyundai. Why? As has been true for years, the latest Sonata makes a compelling right-brain argument in favor of purchase. It is an exceptionally good value, it almost always has plenty of dealer cash sitting on its hood in order to make the price even more compelling, it comes with one of the best warranty and roadside-assistance plans in America, and now it offers free Blue Link for three years. Plus, the Sonata is one of the roomiest cars in its class and does an outstanding job of protecting you and your loved ones in the unfortunate event of a collision. For 2018, and especially in 2.0T format, the Sonata also makes a left-brain case for consideration. The turbocharged engine produces a satisfying rush of acceleration, the mechanicals are tuned for greater driving enjoyment, and the bigger wheels supply an extra dose of visual appeal. It still isn’t a sport sedan, but it qualifies as a sporty sedan. Overall, the 2018 Sonata is a nice car to look at, a nice car to drive, and a nice car to spend hours at a time in. 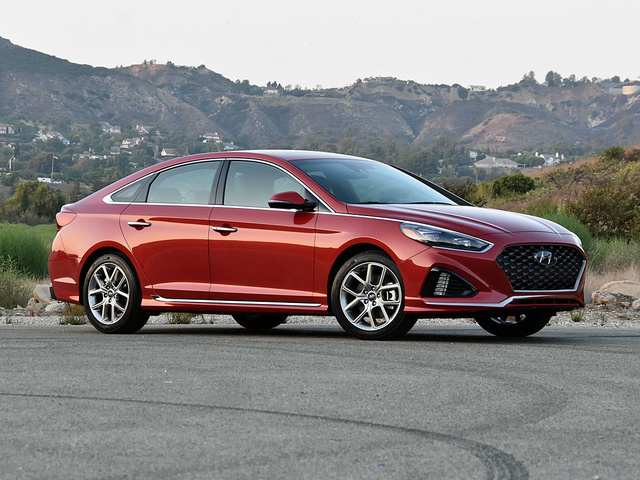 Whether this admittedly mild praise for the new Sonata’s styling and driving dynamics is enough to reverse Hyundai’s sagging fortunes in a midsize sedan segment that is shrinking by the day remains to be seen. What's your take on the 2018 Hyundai Sonata? BadHyundai Decent car overall, however like the other poster said the headlights have a large dark area on them in the low beams. This is incredibly dangerous and I worry that someday I may hit something or someone! Hyundai needs to fix this. I'm surprised this car passed any safety inspection because night time driving is so dangerous! SeatLGuru Wish I had known about the problems with the 2.4L engine. First maintenance at 3700 miles had the knock sensor detection software update and it identified an issue. I know the warranty was extended but worried about the safety since a teen will be primary driver. 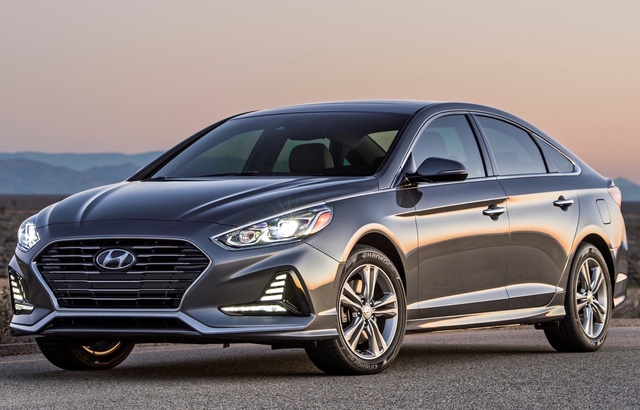 Users ranked 2018 Hyundai Sonata against other cars which they drove/owned. Each ranking was based on 9 categories. Here is the summary of top rankings. Have you driven a 2018 Hyundai Sonata? Enter your zip to see incentives for a new Sonata in your area.